July mornings on Lake Michigan’s coast usually start a bit cooler, not this particular day. With a balmy 78 degrees at 3:45 am, it was going to be another warm one. Temperatures were predicted to hit 90 plus, with very little wind and lots of sunshine. While this might be normal for central Wisconsin, Algoma is the place most folks go to escape the heat. Another hot one… The surface temps already have crept to the upper 60’s and warming deeper is the trend. I turned to my son, Trevor, and let him know we would run this charter trip a bit further today, drop lines in about 150 feet and go out from there. The day before, the kings seemed a bit deeper and the steelhead were 250 and out. As we slowed, Trevor was already getting his Slide Diver rigged with a white Opti flasher and Aqua Howie fly, ready to hit the water. With the fish deeper in the warmer water, using the magnum weights and big rings on the Slide Divers allows us get them down below 100 feet and keep them “in the zone” for the active kings. Using the Slide Divers also lets me use longer leads to stretch the baits back a little farther from the boat and get more strikes. That day Trevor set the flasher/fly combo about 50 feet back, before setting the Slide Diver, and then let it down 100 feet to start. It was still dark and the marks were still a little higher, but we’ll drop the rigs deeper as it starts getting light. The 15 and 17 pound weights on my downriggers would get us down deeper later on but as Trevor set his corner at 65’, the rod hosting his Slide Diver rig bent sternly back and the drag of his reel started screaming! “FISH, FISH, FISH” he shouted, “IT’S A BIG ONE TOO, WHO’S UP?” he shouted! Just then, the Ugly Stik on my center rigger popped and bent down to the water with the drag screaming… “ANOTHER ONE! I KNEW THAT BLOODY NOSE SLIDE DIVER WOULD GO, IT WAS HOT YESTERDAY TOO!” Trevor screamed. He was right, as we kept lowering the baits, the kings kept biting. It slowed soon enough, but for now action was HOT. As the warm summer kept easing the surface temperatures of Lake Michigan up, the fish seemed to stay out and down a bit deeper. Something I kind of expected with the mild winter and very early spring weather. This was a little early for this tactic, but you can still capture fish if you understand where the active fish will be hiding out. Just then, Trevor jumped up, “HIGH BIRD, SEE THE STEELIE JUMPING?” He shouted. We didn’t keep ALL the baits low. To keep more baits in the “fish zones,” I rigged up my Ugly Stik / Alphamar combos with Trilene 100% Professional Braid in 65# test. I used 10 ounce and 12 ounce weights and ran them 120 to 250 feet back behind large Yellow Bird planer boards to get them down 80 to 150 feet and keep my flasher/fly and spoons down deep where the kings are hanging out. My Slide Divers have the magnum weights and magnum rings to get those well below the 100-foot mark and spooled my Traxstech downriggers with 300 feet of cable and running 15 pound and 17 pound weights. If the fish go deeper yet, they will easily handle up to 26 pound weights. I also spooled my downrigger combos with 50# Trilene braid and 60 feet of Trilene Professional fluorocarbon line. I can run my riggers very deep without seeing my line bow way back and also the braid telegraphs every bite back to the rod amazingly well, when running deep riggers. Steelhead will often stay near the surface where they can target bugs on the surface and still attack higher swimming alewife. While my larger, inside Yellow Bird planer boards are pulling 10 ounce weights with varying long lengths of line to reach the deeper kings, I like to keep at least one smaller planer on the outside of my spread, pulling a brightly colored spoon, usually with orange or red on silver, to entice that occasional steelhead strike. Some days during mid-summer, several higher baits per side are very effective in capturing those roaming steelhead. As we all enjoy a warm summer this season, don’t forget to look deep for the kings as the surface temperature heats up. Running flasher/fly combos and glow spoons near thermoclines setting up down deep can entice hungry king action. I also try to keep a few spoons near the surface to tease some tail-dancing steelhead. There’s nothing like a mixed bag in the cooler! 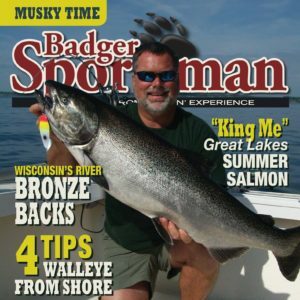 For current fishing reports or information on charter fishing in the Algoma area, check out my report page at www.FishAlgoma.com. You can even sign up for periodic newsletters and fishing reports. From Captain Lee and the crew aboard the Grand Illusion 2, we are looking forward to seeing all of you on the water this summer. Good Luck and Good Fishing! 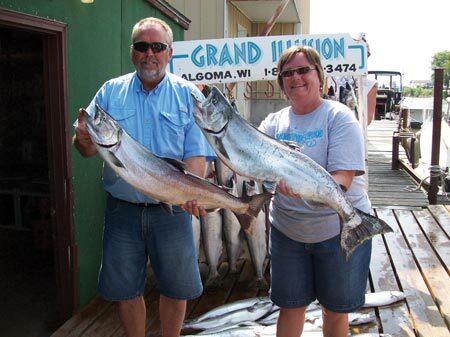 Lee Haasch is an Algoma charter captain with over 40 years of Great Lakes fishing experience. He’s been writing and giving seminars for more than 25 years. Contact: FishAlgoma.com or call 888-966-3474. TIP OF THE MONTH. Lake Michigan waters have gotten cleaner and clearer over the last several years. Zebra mussels, less nutrients washed into the lake, whatever the reason, the result has been gin clear water. This has the fishermen adapting to the conditions. The clear water enables the fish to see the boat and other objects that may cause them to hesitate to take your baits. The best way to entice the bite is to keep your baits farther away from the boat with weights or divers. A couple of ways I do this are using Yellow Bird planer boards to keep rigs wide from the boat and capture those fish that shy wide of the boat. Next, I use Slide Divers to allow me to stretch my leads behind the Slide Diver 50 to 75 feet back. 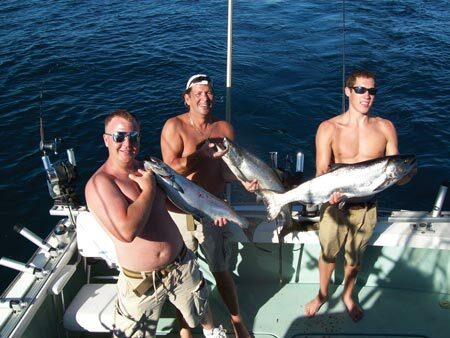 When a fish hits, it slides down to about 3 feet in front of the fish to allow easy netting. Lastly, to keep my downriggers working for me, I spool my Alphamar’s with 50# Trilene braid and then attach a 75-foot leader of 25# Trilene fluorocarbon leader using an improved albright knot. The knot will reel right up and I can run very deep downriggers and stretch my lead back 75 feet behind the ball, reduce bow back and the braid will telegraph every little bite to the rod tip.